Shreya Ghoshal (born 12 March 1984) is an Indian playback singer. She has received four National Film Awards, seven Filmfare Awards including six for Best Female Playback Singer, nine Filmfare Awards South, four Kerala State Film Awards and two Tamil Nadu State Film Awards. She has recorded songs for film music and albums in various Indian languages and has established herself as a leading playback singer of Indian cinema. Ghoshal aspired to become a playback singer from an early age. At the age of four, she started learning music. At the age of six, she started her formal training in classical music. At the age of sixteen, she was noticed by film-maker Sanjay Leela Bhansali when she entered and won the television singing reality show Sa Re Ga Ma Pa. Following that, she made her Bollywood playback singing debut with Bhansali's romantic drama Devdas (2002) for which she received a National Film Award, a Filmfare Award for Best Female Playback Singer and a Filmfare RD Burman Award for New Music Talent. Shreya Ghoshal was born on 12 March 1984 to a Bengali Hindu family in Baharampur, Murshidabad district, West Bengal. [A] She grew up in Rawatbhata, a small town near Kota, Rajasthan. Her father, Bishwajit Ghoshal is an electrical engineer and works for the Nuclear Power Corporation of India, and her mother, Sarmistha Ghoshal, is a literature post-graduate. She has a younger brother, Soumyadeep Ghoshal. At the age of four, she started learning music. Ghoshal completed her schooling up to eighth grade at the Atomic Energy Central School in Rawatbhata. In 1995, she won the All India Light Vocal Music Competition, New Delhi, organised by Sangam Kala Group, in Light Vocal group in sub-junior level. In 1997, when her father was transferred to the Bhabha Atomic Research Centre, she was relocated to Mumbai, with her family and studied at the Atomic Energy Central School in Anushakti Nagar. She joined the Atomic Energy Junior College to study science. She withdrew from the junior college and enrolled at the SIES College of Arts, Science, and Commerce in Mumbai, where she took up arts with English as her major. Ghoshal's mother used to help her in rehearsals and accompany her on the Tanpura, starting with mostly Bengali songs. At the age of six, Ghoshal started with her formal training in classical music. She acquired training from Late Kalyanji Bhai for 18 months and continued her classical music training with Late Mukta Bhide in Mumbai. Her first stage performance was made at a club's annual function. When she turned six, she started her lessons in Hindustani classical music. In 2000, at the age of sixteen, she participated and won the television music reality show Sa Re Ga Ma (now Sa Re Ga Ma Pa) on the channel Zee TV. On 5 February 2015, Ghoshal married her childhood friend Shiladitya Mukhopadhyaya in a traditional Bengali ceremony. Before getting married, Ghoshal dated him for almost 10 years. According to Ghoshal, apart from being a singer, she loves to travel and read books but it's cooking that has a healing effect on her. Her first ever recorded song was "Ganraj Rangi Nachato" which is a cover version of a Marathi song originally sung by Lata Mangeshkar. Her first studio album was Bendhechhi Beena, which was released on 1 January 1998, with 14 tracks. Some of her earlier albums are O Tota Pakhi Re, Ekti Katha (1999), and Mukhor Porag (2000). Ghoshal recorded Bengali studio album Rupasi Raate (2002). Ghoshal recorded devotional songs in albums like Banomali Re (2002), and later, Krishna Bina Ache Ke (2007). Ghoshal caught the attention of director Sanjay Leela Bhansali when she participated in the 75th children's special episode of Sa Re Ga Ma. Bhansali's mother was watching the show and during Ghoshal's performance, she called him to watch her performance, after which he decided to give her a chance in his next film. According to Bhansali, Ghoshal's voice had the innocence needed for the character of Paro in Devdas (2002). In 2000, Bhansali and music director Ismail Darbar offered her the opportunity to be the voice of Paro, the lead female character of Devdas, who was portrayed by Aishwarya Rai. Ghoshal sang five songs in the film, namely, "Silsila Ye Chaahat Ka", "Bairi Piya", "Chalak Chalak", "Morey Piya", and "Dola Re Dola", with established singers such as Kavita Krishnamurthy, Udit Narayan, Vinod Rathod, KK, and Jaspinder Narula. She was sixteen when she recorded the first song for the film, "Bairi Piya" with Udit Narayan. Her Higher Secondary Examinations were nearing that time and she would take her books and notebooks to the studio in order to study during downtime. "Bairi Piya" was an instant success and topped the charts. The film garnered her first Filmfare Award for Best Female Playback Singer for "Dola Re" (shared with Kavita Krishnamurthy) and a National Film Award for Best Female Playback Singer for "Bairi Piya". Her performance also won her the Filmfare RD Burman Award for New Music Talent. — Ghoshal sharing her experience of recording "Bairi Piya"
She was an immediate success and was called by various regional film industries for recording songs in her voice. Ghoshal was next heard in Darbar-composed Desh Devi, where she performed three tracks for the film. After rendering traditional semi-classical songs for her previous ventures, Ghoshal performed two seductive numbers for M. M. Kreem's Jism, which prevented her from being stereotyped. According to Ghoshal, "Jaadu Hai Nasha Hai" and "Chalo Tumko Lekar Chale" from the film "made everyone look at [her] in a new light", opening the doors to a "versatile image". She was awarded with another Filmfare trophy for Best Female Playback Singer for the song "Jaadu Hai Nasha Hai". She thereupon worked with Anu Malik, where she performed the female version of "Aye Meri Zindagi", "Seena Pada" and "Aai Jo Teri Yaad", along with the bhajan-styled "Har Taraf". In spite of providing vocals for "Har Taraf", Ghoshal also made her first on-screen appearance in Saaya. Apart from Inteha, Ghoshal provided vocals for Malik in two other films, Munna Bhai M.B.B.S. and LOC Kargil, where she recorded the song "Chann Chann" for the former and "Pyaar Bhara Geet" for the latter, along with Sonu Nigam. Besides, Ghoshal made her first collaboration with Shankar–Ehsaan–Loy by performing the female version of the song "Tu Hi Bata Zindagi". Calling her singing "effortless" in the song, The Hindu mentioned that she was "able to impart the required emotions" for the song. In 2004, Ghoshal contributed to the soundtrack album of Thoda Tum Badlo Thoda Hum by performing four tracks, which were labelled with an "average" tag by Joginder Tuteja from Bollywood Hungama. However, he was "impressed" with Ghoshal's rendition from her songs in Khakee, where he affirmed that Ghoshal's voice suits Aishwarya Rai to the "core" and she "lends credibility to the entire song" in "Wada Raha". Besides, the two duets with Nigam; "Dil Dooba" and "Youn Hi Tum Mujhse", were equally favored by music critics. Further complimenting her vocals in the song "Hum Tumko Nigahon Mein" and "Soniye" from Garv, Tuteja asserted that Ghoshal's "vocals have started to suit the current breed of actresses better and better with each passing day". Apart from Dil Bechara Pyaar Ka Maara, Ghoshal worked with Nikhil–Vinay in other projects, by recording "Betab Dil Hai" from Phir Milenge, and "Woh Ho Tum" from Muskaan. During the time, Nadeem–Shravan composed Tumsa Nahin Dekha: A Love Story was considered to be the biggest album for Ghoshal, as she sang all the numbers with an exception of one song. She performed a wide variety of songs—from a jazzy number to soft romantic tunes—in the album. According to Ghoshal, the album allowed her to "experiment with the entire range" of her "singing capabilities". Besides, Ghoshal lent her voice for Malik, where she sang "Tumhe Jo Maine Dekha" and "Gori Gori" for Main Hoon Na apart from the title track—which received the maximum praise from critics. Mid Day affirmed that Ghoshal provided "perfect accompaniment" for the track, while Rediff.com was "impressed with her rendition". The year marks her first collaboration with Rajesh Roshan and Daboo Malik by singing the melodious track for the former composed "Saansein Ghulne Lagi" from Aetbaar and performing the track "Shikdum" from Dhoom, for the latter. Ghoshal was bestowed with her second National Film Award for her rendition of "Dheere Jalna" in Paheli. As claimed by Daily News and Analysis, the song "treads the fine balance between the classical and popular genre of Hindi film music". Barring the song "Dheere Jalna", Ghoshal was heard in two other tracks "Kangna Re" and "Minnat Kare", composed by M.M. Kreem. She provided vocals for Kreem in one of his another compositions: "Guzar Na Jaye" from Rog. With the film Parineeta, she made her first collaboration with Shantanu Moitra. She performed four tracks from the film alongside Nigam, which includes "Piyu Bole", "Kasto Mazza" and "Soona Man Ka Aangan". Thereupon, the duo worked for the soundtrack album of Yahaan, performing a soulful track "Naam Adaa Likhna", "Urzu Urzu Durkut" and a Punjabi track "Mele Chaliyan". Ghoshal's work in both the films was widely acclaimed, subsequently being nominated for the Filmfare Awards with the song "Piyu Bole". Reportedly, Ghoshal was selected to sing the female rendition of the track after being auditioned by many other artistes. In an interview, Moitra stated; "Pradeep wanted a little trill of laughter in the middle of the song and she did it effortlessly". Along with "Piyu Bole", Ghoshal received another Filmfare nomination for her rendition of the song "Agar Tum Mil Jao" from Zeher. The song along with "Jaane Ja Jaane Ja" from the same film was acclaimed by music critics. Apart from providing supporting vocals for Himesh Reshammiya's "Aashiq Banaya Aapne", Ghoshal's voice had been used in some of his other compositions released during the year. However, while reviewing Malik-composed "Pehle Se", Bollywood Hungama wrote: "Ghoshal sings in a mature manner and does well once again to prove herself as a dependable playback singer". Similar sentiments were echoed for the song "Bolo To" from Shabd which was composed by Vishal–Shekhar. 2006 marks Ghoshal's first collaboration with Ravindra Jain in film Vivah, where she performed three duets with Narayan titled "Mujhe Haq Hai", "Do Anjaane Ajnabi" and "Milan Abhi Aadha Adhura Hai". For the album, she also recorded "Hamari Shaadi Mein" with Babul Supriyo and two sisters conversation song "O Jiji" with Pamela Jain, along with a bhajan performed with Jain. Ghoshal's "obsessive" vocals were appraised in Roop Kumar Rathod's composition, "So Jaoon Main" from Woh Lamhe. Despite the length, the version was particularly acclaimed from the album. During the year, Ghoshal performed her first ever duet with Sunidhi Chauhan—though they have contributed in multi-singer songs together—with the Salim–Sulaiman's composition, "Imaan Ka Asar" from Dor. In spite of providing backing vocals for Lage Raho Munna Bhai's "Bande Mein Tha Dum", Ghoshal and Nigam performed a romantic duet titled "Pal Pal", a composition by Moitra. For the song, she received a Best Female Playback Singer nomination at the 52nd Filmfare Awards. She was next heard with Vishal Bhardwaj in the song "O Saathi Re", which exudes the feeling of intimacy and deep love. Ghoshal's low pitch rendition in the song was positively noted by critics. In 2006, Ghoshal sang "Pyaar Ki Ek Kahani", "Koi Tumsa Nahin" and "Chori Chori Chupke Chupke" for Rajesh Roshan-composed Krrish which were also favored by the critics. Reviewing the album, Bollywood Hungama wrote: "Ghoshal is extremely competent and justifies her continued presence in the big league". They also mentioned that Ghoshal has reached to a similar level of Alka Yagnik in terms of "class, quality and style". In 2007, Ghoshal recorded a thumri in the mujra style for Khoya Khoya Chand. Titled "Chale Aao Saiyan" and composed by Moitra, the song was particularly praised for Ghoshal's "different" vocal structure. She even lent her voice for two other songs for the album; "Sakhi Piya" and "Thirak Thirak". She reunited with Moitra for Laaga Chunari Mein Daag, where she performed "Hum To Aise Hain" along with Chauhan which also had Swanand Kirkire and Pranab Biswas lending supporting vocals. Raja Sen found "Kachchi Kaliyaan" song from the film less appealing with its "bad remix background" though praised Ghoshal, Chauhan, KK and Nigam for giving the song "the vim it requires". Apart from providing background alaap in Monty Sharma's composition "Masha-Allah", Ghoshal was heard in the classically oriented numbers "Jaan-E-Jaan" and "Sawar Gayi", included in the album Saawariya. She also recorded her first track in a Sanjay Leela Bhansali's composition, "Thode Badmaash" for the same album, providing a "feminine quality" to her "temperate nuances". During the same year, Ghoshal sang the peppy rain song, "Barso Re" for Mani Ratnam's Guru, a composition by A.R. Rahman. A Review from Oneindia praised Ghoshal's rendition of the song and opined that it was a different incarnation of her in comparison to her previous records. The song won her third Filmfare Award for Best Female Playback Singer. The same year, she came up with the song "Yeh Ishq Haaye" from Jab We Met, composed by Pritam which was successful in earning her a third National Film Award for Best Female Playback Singer. The duo also worked with the classical track "Mere Dholna" for Bhool Bhulaiyaa (2007), performed beside M. G. Sreekumar, which was acclaimed with special mention to the taan towards the "climax of the song". Ghoshal also lent her voice for Vishal–Shekhar with few of his compositions and was particularly praised for the theme song of Ta Ra Rum Pum along with the romantic song "Main Agar Kahoon" and the dance song "Dhoom Taana" from film Om Shanti Om, where some critics compared her singing style of the latter with S. Janaki. In the year, Ghoshal worked with Ilaiyaraaja for the album Cheeni Kum. After singing for films such as U Me Aur Hum, Sirf, Ghatothkach, Dashavatar, Mere Baap Pehle Aap, De Taali, Haal-e-Dil, Thoda Pyaar Thoda Magic and Kismat Konnection, Ghoshal recorded another hit song for Singh Is Kinng (2008), titled "Teri Ore", composed by Pritam Chakraborty. It received mixed reviews from music critics. The song earned her a fourth Filmfare Award for Best Female Playback Singer and overall fifth Filmfare Award. After that, she lent her voice for films like Bachna Ae Haseeno, God Tussi Great Ho, Welcome to Sajjanpur, Kidnap, Karzzzz, Ek Vivaah... Aisa Bhi, Dostana, Yuvvraaj and others. She won her fourth National award for singing "Pherari Mon" for the Bengali film Antaheen (2008), and "Jeev Rangla" for the Marathi film Jogwa (2008). She debuted in the Tamil cinema through the song "Yen Chellam" in Vasanthabalan's film Album (2002), and she received success after singing "Munbe Vaa" from Sillunu Oru Kaadhal under composer A. R. Rahman. She received her first Tamil Nadu State Film Award. She made her Telugu debut for music director Mani Sharma in Okkadu (2003). She made her debut in Kannada cinema with the song "Krishna nee begane baaro" in the movie Paris Pranaya (2003). Ghoshal debuted in Malayalam cinema through a studio album of composer Alphons Joseph and later gave voice to his song "Vida Parayukayano" from Big B (2007). In 2010, Ghoshal sang for the English independent film When Harry Tries to Marry. In the same year, Ghoshal rendered her voice for a song "Aadha Ishq" from film Band Baaja Baaraat which composed by Salim-Sulaiman. Satyajit of Glamsham stated, "Shreya Ghoshal's feminine vocal textures have always been reliable in ballads". In 2011, Ghoshal recorded hit duet song "Saibo" in film Shor in the City with Tochi Raina, a composition by Sachin-Jigar. Satyajit from Glamsham reported, "Sweetly toned and mesmerized with mellifluous flows of Shreya Ghoshal singing, the first outing "Saibo" is a smoothening surprise that extols the feel of romanticism to perfection". Later that year, Ghoshal sang the duet "Teri Meri" in film Bodyguard with Rahat Fateh Ali Khan. A Himesh Reshamiya composition, the song received positive to mixed reviews. NDTV labelled the song as "moderately paced and average". Ghoshal later collaborated with Bappi Lahiri in the duet "Ooh La La" from film The Dirty Picture. Abid from Glamsham stated that Shreya Ghoshal manage to keep up the fun tempo with an improvised and highly entertaining and excellent renditions. 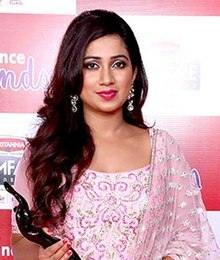 Ghoshal received further two nominations that year at Filmfare Awards for songs "Saibo" and "Teri Meri. In 2012, Ghoshal rendered her voice for popular item song, "Chikni Chameli" from film Agneepath. The song was composed by Ajay-Atul and was a remake of their own Marathi song "Kombdi Palali" from film Jatra. Joginder Tuteja of Bollywood Hungama stated, "A special word for Shreya Ghoshal too who changes her singing style in a big way and comes up trumps. She gets the kind of rustic flavour that was the need of the hour and is superb in her rendition." Ghoshal received her one of the two Filmfare nominations of the year for the song. Later, she revealed that she "wasn't very comfortable" singing the song because of its vulgar lyrics and requested the makers to change few words in it. The same year, she performed four songs, all composed by Sajid–Wajid for film Rowdy Rathore which received mixed reviews from critics. For the duet song "Dhadang Dhang Dhang" performed by Ghoshal alongside Sajid, Devesh Sharma of Filmfare remarked, "Shreya Ghoshal puts the ’90s ka tadka' in her rendition" and for lullaby song "Chandaniya" he said, "Shreya Ghoshal sounds uncannily like Alka Yagnik and proves that she is a singer for all occasions". Joginder Tuteja from Bollywood Hungama stated in relation to "Chandaniya", "Shreya Ghoshal can fit into any mode as per the demand of the situation". The song "Tera Ishq Bada Teekha" received mixed reviews from music critics. Ghoshal then lent her voice in a Four-part harmony song, "Radha" from Student of the Year alongside Udit Narayan, Vishal Dadlani and Shekhar Ravjiani which garnered critical appreciation. In the same year, she again collaborated with A.R. Rahman for a duet song "Saans" from film Jab Tak Hai Jaan along with Mohit Chauhan. The song received positive to mixed reviews by critics. At the poll conducted by Indiatimes, the song Saans won the title of "Most Romantic Song of the year 2012". The song earned Ghoshal second of her two Filmfare nominations of the year. In early 2013, Ghoshal sang two duet songs "Naino Mein Sapna" and "Taki O Taki" for film Himmatwala. The songs were originally composed by Bappi Lahri and re-created by Sajid–Wajid. Both songs received positive reviews from music critics. For "Naino Mein Sapna", critics of NDTV mentioned, "Ghoshal sounds tailormade for the track" and for "Taki Taki" they remarked, "Ghoshal proves yet again her mettle in the industry". For "Naino Mein Sapna", Shivi from Komoi stated, "Shreya Ghoshal replace Lata Mangeshkar and do a decent job". Ghoshal sang the female version of Sunn Raha Hai in Aashiqui 2 composed by Ankit Tiwari and written by Sandeep Nath. She garnered critical praise over Ankit Tiwari who sang the male version of the song. Apart from rendering vocals for A.R. Rahman composed "Banarasiya" in Raanjhanaa, Ghoshal lent her voice for duet "God, Allah aur Bhagwan" in Krrish 3 alongside Sonu Nigam. Though the former song was met with largely positive reviews, the latter was poorly received. Ghoshal next performed two tracks in Goliyon Ki Raasleela Ram-Leela namely "Dhoop" and "Nagada Sang Dhol" both composed by the director of film, Sanjay Leela Bhansali. She earned positive to mixed response for former and mostly positive reviews for the latter. Mohar Basu of Koimoi stated in regards to "Dhoop", "Shreya Ghoshal's voice croons hauntingly and this song evokes a range of deep emotions. Passionately sung and flatteringly themed, this song makes evident the reason why Ghoshal can be compared to music veterans of the industry." Ghoshal received two Filmfare nominations for songs "Sunn Raha Hai" and "Nagada Sang Dhol" that year. In 2014, Ghoshal recorded three songs for film PK namely the solo "Nanga Punga Dost" and duets "Chaar Kadam" and "Love is a Waste of Time" with Shaan and Sonu Nigam respectively. Later in the same year, she sang the duet "Manwa Laage" with Arijit Singh for film Happy New Year composed by Vishal-Shekhar duo and written by Irshad Kamil. Surabhi Redkar of Koimoi stated, "Shreya Ghoshal's voice brings out the mush in you." After its release, "Manwa Laage" crossed one million views within 21 hours and two millions views in 48 hours on YouTube worldwide. Ghoshal got another nomination at Filmfare Awards for the song. 2015 started with Ghoshal's another collaboration with A.R. Rahman in Tamil film I. Besides rendering vocals for original Tamil duet "Pookkalae Sattru Oyivedungal" alongside Haricharan, she also dubbed its Hindi version "Tu Chale" alongside Arijit Singh and Telugu version "Poolane Kunukeyamantaa" alongside Haricharan. The original Tamil version song "Pookkalae Sattru Oyivedungal" was met with positive reviews by critics, with most critics praising the vocals of Ghoshal. Nicy V.P. from International Business Times commented on Tamil version, "Haricharan's crystal clear voice, Shreya's Hindustani driven singing lead to a chart-buster, here. With regards to Shreya Ghoshal, we have to dig deep the dictionary to come up with some new adjectives to praise her singing." Later that year, Ghoshal sang the female version of song "Hasi" from film Hamari Adhuri Kahani composed by Ami Mishra which got critical precedence over male version sung by Ami Mishra himself. Devesh Sharma from Filmfare remarked, "The female version of Hasi, sung by Shreya Ghoshal, works better than the male version, sung by guest composer Ami Mishra himself. Ghoshal elevates it with her superb effort and the softer arrangement works better for it overall." Ghoshal also performed the female version of the song "Gaaye Jaa" for the film Brothers composed by Ajay-Atul which received positive reviews from music critics. The Times of India stated, "Shreya Ghoshal scores brownie points for her rendition". Glamsham praised Ghoshal's vocals labelling them "sugary sweet and superbly controlled". Bollywood Life commented, "Shreya Ghoshal amazes the listener by making this situational song such a great listen and just for her lovely voice, one has to put this song on a loop" The same year saw Ghoshal again collaborating with Sanjay Leela Bhansali in Bajirao Mastani. She performed three songs in the film, namely "Mohe Rang Do Laal", "Deewani Mastani" and "Pinga", all of which met with widespread critical acclaim. She also dubbed these songs in Tamil and Telugu versions of the film's soundtrack. The qawwali interlude song "Deewani Mastani" in the film fetched her sixth Filmfare Award, fifth for Best female playback singer. In early 2016, Ghoshal provided vocals for duet "Tere Bin" from film Wazir alongside Sonu Nigam. Composed by Shantanu Moitra and written by Vidhu Vinod Chopra, the song opened to positive reviews by critics. Labelling the song as "a beautiful start for the film", critics from Bollywood Hungama commented, "Though the sound of song is quite classical for a film which is set in the current times, one can well expect that it would fit in well into the narrative." Ghoshal was next heard in song "Tum Bin Jiya" in film Sanam Re, composed by Jeet Ganguly. It was a recreation of a song with same title from 2001 film Tum Bin sung by K.S. Chitra and composed by Nikhil-Vinay. The song received positive to negative reviews. Ghoshal sang the songs "Mere Aankhon Se Nikle Aansoo" and "Ishq Ki Baarish" written by Sameer and composed by Nadeem Saifi in the film Ishq Forever for which critics compared Ghoshal singing style to veteran singer Alka Yagnik. For the song "Mere Aankhon Se Nikle Aansoo", The Times of India commented, "Shreya create magic in [the song], which is straight from the heart. Ghoshal provided vocals for song "Aatach Baya Ka Baavarla" in Marathi film Sairat composed by Ajay-Atul which was well received by critics. Ghoshal's collaboration with Ankit Tiwari in song "Jab Tum Hote Ho" from film Rustom was critically well received. Devesh Sharma of Filmfare labelled the song "sombre" and praised use of Ghoshal's "melodious" voice in the song. Ghoshal was next heard in Tamil film Devi in which she rendered her vocals for song "Rang Rang Rangoli". Ghoshal also dubbed Hindi version of the song titled "Ranga Re" as the film was released along with Tamil in Hindi and Telugu as well with Telugu version "Rang Rang Rangare" being sung by Swetha Mohan. India West praised the Hindi version by quoting, "Ghoshal proves that she can tread Sunidhi Chauhan terrain effortlessly in parts of the song, and her strong vocals once again put up a strong case for playback singers (females)". The Tamil version of song also opened to positive reviews. In early 2017, Ghoshal rendered "Aashiq Surrender Hua" duet along with co-singer and composer Amaal Mallik from the film Badrinath Ki Dulhania. the song in itself was much appreciated for its quirky lyrics which were penned down by lyricist: Shabbir Ahmed. "Aashiq Surrender Hua" was one of the rare songs in which Ghoshal was heard in a lower register than what she usually sings in. As Swetha Ramakrishnan from Firstpost reiterated, "The best thing about the song is Shreya Ghoshal singing in a lower pitch; something one rarely gets to hear." In regards to the singers, Gaurang Chauhan from Bollywood Life stated, "Both are a unique choice for such a song and they nail it." Ghoshal was next heard in "Rozana" from the film Naam Shabana for which Ghoshal's vocals were specifically met with critically positive reviews. Shriram Iyengar from Cinestaan mentioned, "Ghoshal's voice brings a mesmerising touch to the song, with a perfect balance of happiness and contentment." Praising Ghoshal's vocals in "Rozana", India West commented, "To say that she makes the best out of this increasingly rare occasion in film music is superfluous." Apart from rendering vocals for A R Rahman composed 'Do Dilon Ke' duet along with Hariharan in the Hindi dubbed version of the film: Viceroy's House, Ghoshal also lent her voice for duet 'Hans Mat Pagli 'in Toilet: Ek Prem Katha alongside Sonu Nigam. Both songs were critically acclaimed. Joginder Tuteja from Bollywood Hungama stated that "The combination of Sonu-Shreya takes the song to a different altogether and worthy of repeat hear." In 2017, Ghoshal also sang "Thodi Der" duet with co-singer and music director Farhan Saeed for the film Half Girlfriend. She received a Filmfare Award for Best Female Playback Singer nomination for the song. Komoi stated, "Ghoshal’s voice as sweet as honey mesmerizes the listener in Thodi Der". Glamsham reported, "Ghoshal is simply fantastic and [song] can be put on repeat mode". In the same year, Ghoshal sang two songs in fifth episode of Mixtape, a web series launched by T-Series for which she received positive response. Ghoshal's four Kannada songs were included in The Times of India list of "10 Best Romantic Songs of 2017", which are "Usire Usire" from Hebbuli, "Ondu Malebillu" from Chakravarthy, "Ninna Snehadinda" from Mugulu Nage and "Chippinolagade" from Maasthi Gudi. Her Telgu song "Blockbuster" from Sarrainodu was voted as number one in 10 Best Party Songs of 2017 by the same. 2018 started for Ghoshal collaborating with S. Thaman for the song "Mandhaara" from Bhaagamathie. She later provided her rendition for "Allasani Vaari" from Tholi Prema. She also lent her voice to four songs for the delayed film Phir Se... (2018). Ghoshal continued with song Ghoomar from the period drama Padmaavat, along with Swaroop Khan. Composed by film's director Sanjay Leela Bhansali himself, it was based on the traditional music and dance forms performed by the Rajput queens of Rajasthan. The song was well received, with critics praising Ghoshal for her rendition. Gaurang Chauhan from Times Now noted, "Sung by ever dependable Shreya Ghoshal and legendary Rajasthani folk singer Swaroop Khan, Ghoomer is appealing and will be, if not already, a favourite among dance performers across India." The song was viewed over 10 million times in a single day. Ghoshal was next heard in the recreated version of "Ek Do Teen" from Tezaab (1988) in Baaghi 2 and the title track of Dhadak (2018). Ghoshal performs in musical concerts around the world. In 2013, she went to Australia and New Zealand and gave performances at the Brisbane Convention Center, Dallas Brooks Center in Melbourne, the Sydney Opera House and Vodafone Events Centre in Auckland. In the same year, she performed at the Sharjah Cricket Association Stadium in United Arab Emirates. The same year, she paid her respects to the casualties of an excessive rainfall in Mauritius with a concert at the Swami Vivekananda International Convention Centre in Pailles. Along with Hrishikesh Ranade, she also made a stage performance during the 18th annual day celebration of Airports Authority of India. She made London tours where she performed twice in Royal Albert Hall in 2013 and 2014. On the first tour in 2013, she also celebrate 100 years of Bollywood by performing many of the old Bollywood hits songs. In 2006, along with Sonu Nigam, Sunidhi Chauhan and Shiamak Davar, Ghoshal performed the theme song of 2010 Commonwealth Games at its closing ceremony, as an invitation to everyone to the following Commonwealth Games in Delhi. The same year, she along with Nigam, recorded the title track "Haath Se Haath Milaa" for the album put together by the BBC World Service Trust as part of an AIDS awareness campaign, where profits garnered through the album, was donated to HIV charities. In 2011, she became the brand ambassador for Joyalukkas jewellery. In 2016, Ghoshal performed a charity event to support a 17 years old patient of Acute lymphoblastic leukemia. In the same year, Ghoshal performed her concert in Sydney Olympic Park. In 2017, she performed concerts in the US with a forty member live Symphony band at the Fox Theatre in Detroit. One of Ghoshal's earliest musical memories is listening to her mother, Sarmistha Ghoshal, singing classical Bengali songs at clubs. As a very young child, she was introduced to music by her mother, whom she refers as her first "guru". She states that her mother is her best critic. Ghoshal has acknowledged K S Chitra, Lata Mangeshkar, Asha Bhosle, Geeta Dutt, Mohammed Rafi, Kishore Kumar, Ilaiyaraaja and Mukesh as her inspirations. She has also named Jagjit Singh as her inspiration to perform songs in the genre of Ghazal. Ghoshal has performed songs with a lower vocal range. Her voice has been described as "sweet" with "slight huskiness". In an interview, Ghoshal noted that her voice has transformed from the "girlish tenor" of the earlier days to a more matured texture. Her voice is characterized in the media for being most suitable for higher-pitched renditions, although some critics have said that her voice tends to screech when she reaches a higher note of scale. Similarly, in the book Confession of a Coward — an Indian Adventure, it was stated that Ghoshal's high-pitched vocals are interesting and impressive, but "certainly take some time getting used to it". Ghoshal has voiced against correcting pitch with Auto-Tune. About her singing and rehearsing style, she has said, "I have a special way of writing the lyrics when it is dictated to me. No matter what the language of the song, even if it is Bengali, I write it in Hindi. I have certain notations and markings to indicate the way it should be pronounced. I feel the Devanagari script is the closest to the phonetics of the language. English letters are not very good for that purpose. Moreover, I listen carefully and try to grasp as much as possible when the lyrics are read to me". What makes Ghoshal remarkable among her contemporaries, according to The Indian Express is, the "serenity in her voice" and the "enviable range". Further complimenting her versatile vocal range, they noted: "The honey-dipped inflection of [her voice], which once put in the recording studio, can turn into naughty, sensuous, serious, sad, comic and pure classical, depending on the requirement of the job". Naming her as the "most versatile singer of this generation", India West remarked the smoothness of her voice when flowing from "lower registers to higher notes". According to The Times of India, Ghoshal maintains the "touch of versatility" with her music by singing different style of songs from classical to pure commercial music. In 2003, Ghoshal admitted that she modulates her voice well, hence "none of the music directors have yet been able to label me". Ghoshal took vocal lessons and did workshops with Kalyanji Virji Shah, where she learnt the technique about "throw of voice, straight notes, vibratos". She considers classical music training as an asset in playback since it "keeps one's voice fit and fresh". Music director Shekhar Ravjiani praised Ghoshal for her singing versatility. According to Sonu Nigam, the best quality about Ghoshal is that the expressions come perfectly along with mannerisms. Music director and singer M. Jayachandran praised Ghoshal by saying, "It is amazing how she writes down the lyrics in Hindi and then gives her signature nuanced expressions to Malayalam words". During her interviews, Ghoshal mentioned, "I cannot sing double meaning songs or the songs which have vulgar lyrics". Ghoshal's work has been praised by music directors Ankit Tiwari, Jeet Gannguli, Ghoshal's contemporary singers Papon, Palak Muchal, Sukhwinder Singh,Bombay Jayashri, Javed Ali, Neha Kakkar, Richa Sharma, Pakistani singers Ghulam Ali, Rahat Fateh Ali Khan, Asrar, A cappella band Penn Masala, film actress Dia Mirza, cricketer MS Dhoni. Film makers Vishal Bharadwaj, Karan Johar, and Vidhu Vinod Chopra, have picked Ghoshal as the best female singer from the generation. Singer Kanika Kapoor, a Canadian singer Nesdi Jones, UK singer Roma Sagar, British Indian singer Tripet Garielle, Ananya Nanda, mentioned Ghoshal as their inspiration. Usha Uthup named her among the "voice for the future". Veteran singers Vani Jairam and Manna Dey has praised her musical abilities. Senior singers Alka Yagnik, Asha Bhosle, Lata Mangeshkar, Hemlata, Kavita Krishnamurthy, Kumar Sanu, also picked Ghoshal as the best female singer from the generation. Sonu Nigam mentioned Ghoshal as his favourite singer: "If there'll be best all-time singers, Shreya will surely be included among them". Asjad Nazir, the editor of Eastern Eye called her undisputed queen of playback singing. Ghoshal was also honored from the U.S. state of Ohio, where the governor Ted Strickland declared 26 June as "Shreya Ghoshal Day". The first Shreya Ghoshal Day (26 June 2010) was celebrated among her fans on popular microblogging and social networking sites. In April 2013, she was awarded with the highest honour in London by the members of House of Commons of the United Kingdom. In 2012, Ghoshal appeared in the Forbes Celebrity 100, a list based on income and popularity of India's celebrities. She remained in the top fifty spots for five consecutive years, listed at the forty-second spot in 2012–13, the twenty-eighth spot in 2014, the thirty-third spot in 2015 and the twenty-eighth spot in 2016. In 2013, Forbes India placed her in their "Top 5 Celeb100 Singers and Musicians" list. She is the only Indian singer to include in the list of Verve’s 50 Power Women Of 2016" list. Ghoshal is also known for her style and fashion sense. Ghoshal has said that she has been offered acting roles which she has declined, citing her lack of interest in it. In 2013, the UK-based newspaper Eastern Eye placed her forty-third in their "50 Sexiest Asian Women" list. In 2015, it placed her seventh in their "Greatest 20 Bollywood Playback Singers" list. She was listed third among the "Top Ten Hottest Female Bollywood Lead Singers" by MensXP.com, an Indian lifestyle website for men. Ghoshal is active on social media. She is the sixth most liked Indian personality on Facebook and 47th most followed Indian personality on Twitter, according to the statistics of Socialbakers. She is among the top ten most searched Indian singers on Google Search. In March 2017, she became the first Indian singer to have a wax figure of her made for the display in Indian wing of Madame Tussauds Museum in Delhi. Ghoshal has appeared as a judge on several television reality shows and she also appears in music videos. Ghoshal has won four National Film Awards for Best Female Playback Singing: "Bairi Piya" for Devdas (2002), "Dheere Jalna" for Paheli (2005), "Yeh Ishq Haaye" for Jab We Met (2007), and one award for both songs "Pherari Mon" for the Bengali film Antaheen (2008) and "Jeev Rangla" for the Marathi film Jogwa (2008). She has won seven Filmfare Awards: one RD Burman Award for New Music Talent , and six awards in Best Female Playback Singer category for "Dola Re Dola" for Devdas (2003), "Jaadu Hai Nasha Hai" for Jism (2004), "Barso Re" for Guru (2008), "Teri Ore" for Singh Is Kinng (2009), "Deewani Mastani" for Bajirao Mastani (2016) and "Ghoomar" for Padmavat (2019) .Ghoshal has also won nine Filmfare Awards South for Best Female Playback Singer to date. ^ Although Ghoshal has herself stated her birthplace as Murshidabad, many sources including Ghoshal's official site mention her birthplace as Baharampur, West Bengal. ^ a b "I like my father being the boss in my life: Shreya". The Times of India. 25 December 2013. Retrieved 12 August 2016. ^ a b "Happy Birthday Shreya Ghoshal: 15 Popular Melodies By The Versatile Singer". CNN-News18. 12 March 2017. Archived from the original on 26 May 2017. Retrieved 19 October 2017. ^ a b c "Shreya Ghoshal Biography". Saavn. Archived from the original on 20 December 2016. Retrieved 13 August 2016. ^ a b c d e "Shreya Ghoshal Biography". Shreya Ghoshal Official Website. Archived from the original on 24 October 2013. Retrieved 17 October 2013. ^ "Shreya Ghoshal May 17, 2012 status update". Twitter. 17 May 2012. Archived from the original on 5 March 2016. Retrieved 16 September 2015. ^ a b Nagarajan, Saraswathy (7 April 2010). "Queen of the charts". The Hindu. Archived from the original on 30 October 2013. Retrieved 17 October 2013. ^ "Shreya Ghoshal on zoom Baatein UNCUT". YouTube. 9 December 2015. Archived from the original on 15 July 2017. Retrieved 19 February 2016. ^ a b c d e f Kulkarni, Ronjita. "I simply closed my eyes and sang". Rediff.com. Archived from the original on 12 October 2015. Retrieved 4 October 2015. ^ a b c d "Shreya Ghoshal: Lesser known facts". The Times of India. Archived from the original on 4 March 2015. Retrieved 16 September 2015. ^ "Shreya Ghoshal Live In Auckland". Indian Weekender. 7 July 2010. Archived from the original on 8 November 2017. Retrieved 9 November 2017. ^ "Birthday Special: Shreya Ghoshal turns 31 today". Dainik Jagran. 12 March 2015. Archived from the original on 2 April 2015. Retrieved 12 March 2015. ^ "Birthday special: आज है सरगम के पहले शब्द जैसी श्रेया घोषाल का जन्मदिन जाने कौन से हैं उनके टॉप टेन सांग". inext. 12 March 2015. Archived from the original on 2 April 2015. Retrieved 12 March 2015. ^ "Happy Birthday Shreya Ghosal". The Indian Express. 12 March 2012. Archived from the original on 9 April 2014. Retrieved 30 September 2015. ^ "Photo of the day: Shreya Ghoshal ties the knot with childhood sweetheart Shiladitya". CNN-IBN. 6 February 2015. Archived from the original on 9 June 2015. Retrieved 6 February 2015. ^ "Balance music and education: Shreya". The Times of India. Archived from the original on 5 January 2018. Retrieved 7 July 2017. ^ Vinita Chaturvedi (23 January 2014). "I'd love to be called a Marathi Mulgi: Shreya Ghoshal". The Times of India. Archived from the original on 3 February 2018. Retrieved 23 June 2017. ^ "Bendhechhi Beena: Shreya Ghoshal". Last.fm. Archived from the original on 21 December 2015. Retrieved 11 June 2013. ^ "Ekti Katha: Shreya Ghoshal". Last.fm. Archived from the original on 21 December 2015. Retrieved 11 June 2013. ^ "Mukhor Porag: Shreya Ghoshal". Last.fm. Archived from the original on 14 November 2014. Retrieved 11 June 2013. ^ "Rupasi Raate: Shreya Ghoshal". Last.fm. Archived from the original on 3 February 2018. Retrieved 2 July 2016. ^ "Banomali Re: Shreya Ghoshal". Last fm. Archived from the original on 4 March 2016. Retrieved 11 June 2013. ^ "Krishna Bina Ache Ke: Shreya Ghoshal". Last.fm. Archived from the original on 21 December 2015. Retrieved 11 June 2013. ^ "Shreya Ghoshal". AllMusic. Archived from the original on 1 October 2015. Retrieved 22 September 2015. ^ Dasgupta, Priyanka (21 July 2002). "Singing in Devdas was God's greatest gift: Shreya Ghoshal". The Times of India. Archived from the original on 4 November 2012. Retrieved 23 July 2012. ^ "Original Soundtrack Devdas". AllMusic. Archived from the original on 1 October 2015. Retrieved 29 September 2015. ^ a b "Filmfare Awards (2003)". IMDb. Archived from the original on 14 March 2016. Retrieved 5 July 2016. ^ a b "50th National Film Awards" (PDF). Directorate of Film Festivals. Archived (PDF) from the original on 3 March 2016. Retrieved 14 March 2012. ^ "'Desh Devi' songs". Saavn. Archived from the original on 24 September 2015. Retrieved 6 December 2014. ^ Vijayakar, Rajiv (17 March 2013). "Reigning queen bees". Deccan Herald. Archived from the original on 22 December 2015. Retrieved 15 October 2015. ^ a b c Vijayakar, Rajiv (28 July 2012). "Notes from a singer". Deccan Herald. Archived from the original on 4 March 2016. Retrieved 15 October 2015. ^ "Winners of the 49th Manikchand Filmfare Awards". The times of India. 21 February 2004. Archived from the original on 15 September 2016. Retrieved 15 October 2015. ^ "Saaya". Middle East Broadcasting Center. 22 March 2014. Archived from the original on 25 March 2016. Retrieved 18 March 2016. ^ Siddiqui, Rana (30 January 2003). "Melody kid". The Hindu. Archived from the original on 11 March 2008. Retrieved 22 December 2015. ^ "Shreya comes to serenade". The Hindu. 25 May 2004. Archived from the original on 3 February 2018. Retrieved 22 December 2015. ^ "Chords & Notes – LOC Kargil (Saregama, Rs. 55)". The Hindu. 22 December 2003. Archived from the original on 18 April 2016. Retrieved 22 December 2015. ^ "Chords & Notes – Armaan – Shankar Ehsaan Loy – Music Review Hindi". The Hindu. 21 April 2003. Archived from the original on 12 October 2004. Retrieved 22 December 2015. ^ Tuteja, Joginder (1 July 2004). "Thoda Tum Badlo Thoda Hum – Music Review". Bollywood Hungama. Archived from the original on 3 July 2004. Retrieved 22 December 2015. ^ a b Tuteja, Joginder (2 January 2004). "Khakee – Music Review". Bollywood Hungama. Archived from the original on 2 January 2004. Retrieved 22 December 2015. ^ Tuteja, Joginder (28 May 2004). "Garv – Music Review". Bollywood Hungama. Archived from the original on 4 August 2004. Retrieved 22 December 2015. ^ Kusnur, Narendra (23 June 2004). "Music review: Kaun Hai Jo... Music Review". Mid Day. Archived from the original on 6 March 2005. Retrieved 22 December 2015. ^ Kusnur, Narendra (21 January 2004). "Music review of 'Muskaan'". Mid Day. Archived from the original on 29 January 2004. Retrieved 22 December 2015. ^ Tuteja, Joginder (26 July 2004). "Tumsa Nahi Dekha – Music Review". Bollywood Hungama. Archived from the original on 19 October 2004. Retrieved 22 December 2015. ^ a b "I can do item songs too: Shreya Ghoshal". Hindustan Times. 30 August 2004. Archived from the original on 31 August 2004. Retrieved 22 December 2015. ^ Tuteja, Joginder (8 March 2004). "Main Hoon Na – Music Review". Bollywood Hungama. Archived from the original on 8 February 2005. Retrieved 22 December 2015. ^ Kusnur, Narendra (3 March 2004). "Music review of 'Main Hoon Na'". Mid Day. Archived from the original on 5 April 2004. Retrieved 22 December 2015. ^ Pant, Seema (15 March 2004). "You might not want to sing with Main Hoon Na". Rediff.com. Archived from the original on 3 August 2016. Retrieved 22 December 2015. ^ Kusnur, Narendra (26 November 2003). "Music review of 'Aetbaar'". Mid Day. Archived from the original on 10 December 2003. Retrieved 22 December 2015. ^ Tuteja, Joginder (9 July 2004). "Dhoom – Music Review". Bollywood Hungama. Archived from the original on 13 March 2005. Retrieved 22 December 2015. ^ a b "53rd National Film Awards" (PDF). Directorate of Film Festivals. Archived (PDF) from the original on 29 October 2013. Retrieved 19 March 2012. ^ "Amitabh gets best actor award for 'Black'". Daily News and Analysis. 14 September 2007. Archived from the original on 31 July 2017. Retrieved 22 December 2015. ^ Verma, Sukanya (10 May 2005). "Paheli's music transports you". Rediff.com. Archived from the original on 4 August 2016. Retrieved 22 December 2015. ^ Tuteja, Joginder (24 November 2004). "Rog – Music Review". Bollywood Hungama. Archived from the original on 14 February 2007. Retrieved 24 December 2015. ^ Pant, Seema (3 May 2005). "Parineeta is refreshing". Rediff.com. Archived from the original on 4 March 2016. Retrieved 23 December 2015. ^ Tuteja, Joginder (28 April 2005). "Parinneta – Music Review". Bollywood Hungama. Archived from the original on 7 November 2006. Retrieved 23 December 2015. ^ Tuteja, Joginder (30 June 2005). "Yahaan – Music Review". Bollywood Hungama. Archived from the original on 26 June 2007. Retrieved 23 December 2015. ^ a b Tuteja, Joginder (9 February 2006). "51st Annual Filmfare Awards Nominees". Bollywood Hungama. Archived from the original on 7 March 2006. Retrieved 23 December 2015. ^ Tuteja, Joginder (26 February 2005). "Yahaan – Music Review". Bollywood Hungama. Archived from the original on 27 February 2005. Retrieved 24 December 2015. ^ Tuteja, Joginder (2 August 2005). "Aashiq Banaya Aapne – Music Review". Bollywood Hungama. Archived from the original on 21 February 2007. Retrieved 24 December 2015. ^ Tuteja, Joginder (30 May 2005). "Fareb – Music Review". Bollywood Hungama. Archived from the original on 17 February 2007. Retrieved 26 December 2015. ^ Tuteja, Joginder (11 December 2004). "Shabd – Music Review". Bollywood Hungama. Archived from the original on 29 October 2007. Retrieved 26 December 2015. ^ Verma, Sukanya (3 October 2008). "Vivah's music disappoints". Rediff.com. Archived from the original on 14 April 2013. Retrieved 28 December 2015. ^ Tuteja, Joginder (28 September 2006). "Vivah – Music Review". Bollywood Hungama. Archived from the original on 29 June 2007. Retrieved 28 December 2015. ^ Roy, Indranil (23 September 2006). "Soaring polularity charts". Daily News and Analysis. Archived from the original on 3 February 2018. Retrieved 22 December 2015. ^ Verma, Sukanya (23 August 2006). "Woh Lamhe's music is worth a listen". Rediff.com. Archived from the original on 4 March 2016. Retrieved 28 December 2015. ^ Tuteja, Joginder (16 August 2006). "Woh Lamhe – Music Review". Bollywood Hungama. Archived from the original on 7 September 2007. Retrieved 28 December 2015. ^ Vijayakar, Rajiv (17 March 2013). "Reigning queen bees". Deccan Herald. Archived from the original on 22 December 2015. Retrieved 13 October 2015. ^ Tuteja, Joginder (26 July 2006). "Lage Raho Munnabhai – Music Review". Bollywood Hungama. Archived from the original on 26 October 2007. Retrieved 28 December 2015. ^ "Nominations for the 52nd Filmfare Awards". Bollywood Hungama. 8 February 2007. Archived from the original on 17 February 2007. Retrieved 28 December 2015. ^ a b Tuteja, Joginder (5 July 2006). "Omkara – Music Review". Bollywood Hungama. Archived from the original on 3 April 2007. Retrieved 28 December 2015. ^ Verma, Sukanya (12 July 2008). "Omkara's music rocks". Rediff.com. Archived from the original on 4 March 2016. Retrieved 28 December 2015. ^ a b c Tuteja, Joginder (28 April 2006). "Krrish – Music Review". Bollywood Hungama. Archived from the original on 20 February 2007. Retrieved 28 December 2015. ^ "To Catch A Star: Shreya Ghoshal". Rajeev Masand. Archived from the original on 22 December 2015. Retrieved 3 December 2015. ^ Tuteja, Joginder (8 November 2007). "Khoya Khoya Chand – Music Review". Bollywood Hungama. Archived from the original on 25 December 2007. Retrieved 29 December 2015. ^ a b Sen, Raja (6 November 2007). "Buy Khoya Khoya for the title song". Rediff.com. Archived from the original on 4 March 2016. Retrieved 29 December 2015. ^ "Laaga Chunari Mein Daag (Music Review)". Sify. 7 September 2007. Archived from the original on 24 December 2015. Retrieved 24 November 2015. ^ "Moitra's magic continues with 'Laaga Chunari Mein Daag'". Daily News and Analysis. 17 September 2007. Archived from the original on 22 December 2015. Retrieved 24 November 2015. ^ Tuteja, Joginder (21 September 2007). "Saawariya – Music Review". Bollywood Hungama. Archived from the original on 9 December 2007. Retrieved 29 December 2015. ^ Verma, Sukanya (24 September 2007). "Saawariya soundtrack, a superior product". Rediff.com. Archived from the original on 4 March 2016. Retrieved 29 December 2015. ^ Bhattacharya, Sumit (20 November 2006). "Guru's soundtrack is typical Rahman". Rediff.com. Archived from the original on 4 March 2016. Retrieved 29 December 2015. ^ "Barso Re song info". Saavn. Archived from the original on 21 September 2013. Retrieved 2 September 2013. ^ "Guru – Music Review". Oneindia.in. 22 November 2006. Archived from the original on 7 January 2015. Retrieved 2 September 2013. ^ "Winners of 53rd Annual Filmfare Awards". Bollywood Hungama. 23 February 2008. Archived from the original on 22 November 2011. Retrieved 23 February 2008. ^ "Kareena, SRK win Best actor awards". Daily News and Analysis. 24 February 2008. Archived from the original on 3 February 2018. Retrieved 22 December 2015. ^ a b Sharma, Parul (7 September 2009). "'Kanchivaram' wins national award for best feature film". The Hindu. Archived from the original on 5 May 2014. Retrieved 11 September 2011. ^ Verma, Sukanya (6 September 2007). "Bhool Bhulaiyaa's music is enjoyable". Rediff.com. Archived from the original on 24 September 2015. Retrieved 29 December 2015. ^ Tuteja, Joginder (3 April 2007). "Ta Ra Rum Pum – Music Review". Bollywood Hungama. Archived from the original on 22 December 2007. Retrieved 29 December 2015. ^ Tuteja, Joginder (13 September 2007). "Om Shanti Om – Music Review". Bollywood Hungama. Archived from the original on 22 December 2007. Retrieved 29 December 2015. ^ "'Om Shanti Om' recalls music of an earlier age". Daily News and Analysis. 20 September 2007. Archived from the original on 3 February 2018. Retrieved 22 December 2015. ^ a b c "Shreya Ghoshal". Bollywood Hungama. Archived from the original on 23 September 2015. Retrieved 2 September 2015. ^ "Shreya Ghoshal Biography". Last.fm. Archived from the original on 6 February 2016. Retrieved 22 September 2015. ^ "Singh Is Kinng". Saavn. Archived from the original on 24 September 2015. Retrieved 12 October 2013. ^ "Singh Is Kinng music review". Glamsham. Archived from the original on 16 October 2013. Retrieved 12 October 2013. ^ "Music review: Singh is Kinng". Rediff.com. 7 July 2008. Archived from the original on 13 February 2014. Retrieved 12 October 2013. ^ "Filmfare: 'Jodha...' bags 5, Priyanka, Hrithik shine". The Times of India. 1 March 2009. Archived from the original on 3 September 2013. Retrieved 5 March 2009. ^ a b "National Film Awards: Priyanka gets best actress, 'Antaheen' awarded best film". The Times of India. 23 January 2010. Archived from the original on 27 March 2015. Retrieved 27 January 2010. ^ a b "56th National Film Awards" (PDF). Directorate of Film Festivals. Retrieved 27 March 2012. ^ "SOK – Music review by and for dummies!!". Behindwoods. Archived from the original on 25 December 2015. Retrieved 28 September 2015. ^ Borah, Prabalika M. (20 August 2012). "Songs unstoppable". The Hindu. Archived from the original on 3 February 2018. Retrieved 28 September 2015. ^ "Shreya Ghoshal rocks". The Hindu. 5 February 2009. Retrieved 29 September 2015. ^ "Original Motion Picture Soundtrack: When Harry Tries To Marry". AllMusic. Archived from the original on 13 March 2016. Retrieved 28 September 2015. ^ "Music Review of Band Baaja Baaraat". glamsham.com. Archived from the original on 9 February 2017. Retrieved 9 February 2017. ^ a b "Music Review : Shor – In The City". Glamsham. Archived from the original on 11 August 2016. Retrieved 26 June 2016. ^ a b c "Music Review: Bodyguard". NDTV. Archived from the original on 13 September 2015. Retrieved 26 June 2016. ^ Sukanya Verma. "Review: Bodyguard music is average". Rediff. Archived from the original on 27 April 2016. Retrieved 26 June 2016. ^ a b Abid. "Music Review : The Dirty Picture". Glamsham. Archived from the original on 11 August 2016. Retrieved 25 June 2016. ^ "Nominations for 57th Idea Filmfare Awards 2012". Bollywood Hungama. 11 January 2010. Archived from the original on 13 January 2012. Retrieved 7 November 2014. ^ "Music Review : Agneepath". Glamsham. Archived from the original on 11 August 2016. Retrieved 25 June 2016. ^ "Meet the musician duo behind 'Chikni Chameli'". Rediff. 25 January 2012. Archived from the original on 27 April 2012. Retrieved 27 April 2012. ^ "Agneepath: Critic Review". Bollywood Hungama. Archived from the original on 7 January 2012. Retrieved 25 June 2016. ^ a b "Nominations for 58th Idea Filmfare Awards 2012". Bollywood Hungama. 13 January 2013. Archived from the original on 16 January 2013. Retrieved 7 November 2014. ^ Goyal, Samarth (4 February 2017). "I was not comfortable singing many item songs post Chikni Chameli: Shreya Ghosal". Hindustan Times. Retrieved 3 March 2018. ^ a b Anand Vaishnav (27 April 2012). "Music Review of Rowdy Rathore". IndiaTimes. Archived from the original on 14 September 2016. Retrieved 19 August 2016. ^ a b Satyajit (14 May 2012). "Music Review of Rowdy Rathore". Glamsham. Archived from the original on 21 March 2016. Retrieved 19 August 2016. ^ a b Devesh Sharma (30 May 2012). "Music Review of Rowdy Rathore". Filmfare. Archived from the original on 21 August 2016. Retrieved 19 August 2016. ^ a b Joginder Tuteja (3 May 2012). "Music Review of Rowdy Rathore". Bollywood Hungama. Archived from the original on 19 October 2015. Retrieved 19 August 2016. ^ "Student of the Year Music Review". Yahoo!. Archived from the original on 1 February 2016. Retrieved 25 June 2016. ^ "Music Review : Jab Tak Hai Jaan". Glamsham. Archived from the original on 19 October 2012. Retrieved 25 October 2012. ^ "MUSIC REVIEW – Jab Tak Hai Jaan". Indiatimes. Archived from the original on 10 October 2012. Retrieved 10 October 2012. ^ Joginder Tuteja. "Jab Tak Hai Jaan Music Review". Bollywood Hungama. Archived from the original on 12 October 2012. Retrieved 10 October 2012. ^ Priya Gupta, Garima Sharma. "The most romantic song of 2012 is..." Times of India. Archived from the original on 1 September 2013. Retrieved 1 September 2013. ^ a b "Music Review of Himmatwala". NDTV.com. 7 March 2013. Archived from the original on 22 August 2016. Retrieved 21 August 2016. ^ a b Shivi (26 February 2013). "Music Review of Himmatwala". Koimoi.com. Archived from the original on 28 August 2016. Retrieved 21 August 2016. ^ Joginder Tuteja (25 February 2013). "Music Review of Himmatwala". Bollywood Hungama. Archived from the original on 18 June 2013. Retrieved 21 August 2016. ^ Rafat (3 May 2012). "Music Review of Himmatwala". glamsham.com. Archived from the original on 22 August 2016. Retrieved 21 August 2016. ^ a b Rajiv Vijayakar (22 April 2013). "Aashiqui 2 (2013) Critic Music Review". Bollywood Hungama. Archived from the original on 23 January 2015. Retrieved 21 January 2015. ^ a b Mohar Basu (19 September 2016). "Raanjhana Music Review". Koimoi. Archived from the original on 21 February 2016. Retrieved 10 July 2016. ^ Yashika Mathur (8 June 2013). "Music Review: 'Raanjhanaa' music glorifies love in unique way". Daily News and Analysis. Archived from the original on 6 November 2016. Retrieved 10 July 2016. ^ Joginder Tuteja (23 September 2013). "Review: Krrish 3 music falls short of expectations". Rediff. Archived from the original on 10 September 2016. Retrieved 10 July 2016. ^ a b c "Ram-Leela Music Review". Mohar Basu. Koimoi. Archived from the original on 5 October 2013. Retrieved 5 October 2013. ^ "Music Review (Business Standard)". Archived from the original on 14 November 2013. Retrieved 15 October 2013. ^ "Review: Folk flavour dominates Ram-Leela's music". Archived from the original on 14 October 2013. Retrieved 15 October 2013. ^ "Nominations for 59th Idea Filmfare Awards". Bollywood Hungama. 14 January 2014. Archived from the original on 7 November 2014. Retrieved 7 November 2014. ^ "Music Review: PK". Filmfare. Archived from the original on 9 March 2016. Retrieved 17 January 2016. ^ a b "Happy New Year Music Review". Koimoi. Archived from the original on 10 March 2016. Retrieved 25 June 2016. ^ "Music review: Happy New Year's music is trendy and young at heart". Hindustan Times. Archived from the original on 6 March 2016. Retrieved 25 June 2016. ^ "Manwa Laage crosses a million views in 21 hours!". The Times of India. 11 September 2014. Archived from the original on 17 May 2017. Retrieved 23 August 2016. ^ "Manwa Laage crosses two millions views in 48 hours!". The Times of India. 12 September 2014. Archived from the original on 19 May 2017. Retrieved 23 August 2016. ^ Filmfare Editorial (19 January 2015). "Nominations for the 60th Britannia Filmfare Awards". Filmfare. Archived from the original on 10 January 2016. Retrieved 19 January 2015. ^ a b c d Nicy V. P. (15 September 2014). "'I' Music Review Roundup: AR Rahman-Shankar Team Creates Magic Again". International Business Times. Archived from the original on 7 October 2014. Retrieved 31 December 2014. ^ "'I' audio review". Sify. 15 September 2014. Archived from the original on 7 November 2014. Retrieved 30 December 2014. ^ "I-Hindi track list". Saavn. 29 December 2014. Archived from the original on 24 September 2015. Retrieved 29 December 2014. ^ "I-Telugu track list". iTunes India. 30 December 2014. Archived from the original on 12 February 2015. Retrieved 30 December 2014. ^ a b Devesh Sharma. "Music Review: Hamari Adhuri Kahani". Filmfare. Archived from the original on 7 August 2016. Retrieved 26 June 2016. ^ Surabhi Redkar. "Hamari Adhuri Kahani Music Review". Koimoi. Archived from the original on 21 February 2016. Retrieved 26 June 2016. ^ a b Rafat (3 August 2015). "Music Review of Brothers". Glamsham. Archived from the original on 27 August 2016. Retrieved 25 August 2016. ^ a b Sreeju Sudhakaran (12 August 2015). "Music Review of Brothers". Bollywood Life. Archived from the original on 25 August 2016. Retrieved 25 August 2016. ^ a b Kasmin Fernandes (7 August 2015). "Music review of Brothers". The Times of India. Archived from the original on 26 June 2016. Retrieved 25 August 2016. ^ "Music review of Brothers". Rediff. 8 August 2015. Archived from the original on 10 September 2016. Retrieved 25 August 2016. ^ Kasmin Fernandez. "Music Review: Bajirao Mastani". The Times of India. Archived from the original on 22 January 2016. Retrieved 26 June 2016. ^ "Review: Bajirao Mastani's music is a roller coaster ride". Rediff.com. 5 December 2015. Archived from the original on 22 June 2016. Retrieved 24 June 2016. ^ "'Bajirao Mastani' music review: swings between sombre, earthy, poignant, soulful and brash". The Indian Express. Archived from the original on 26 August 2017. Retrieved 26 June 2016. ^ "Sanjay Leela Bhansali - Bajirao Mastani (Tamil) [Original Motion Picture Soundtrack]". iTunes. Archived from the original on 22 August 2016. Retrieved 18 May 2016. ^ "Sanjay Leela Bhansali - Bajirao Mastani (Telugu) [Original Motion Picture Soundtrack]". iTunes. Archived from the original on 22 August 2016. Retrieved 18 May 2016. ^ "61st Filmfare Awards". The Times of India. 16 January 2016. Archived from the original on 15 September 2016. Retrieved 15 September 2016. ^ "61st Britannia Filmfare Awards 2016: Arijit Singh and Shreya Samuktha win the Best Singer Award". India.com. 15 January 2016. Retrieved 17 January 2016. ^ a b c Joginder Tuteja (26 December 2015). "Music Review: Wazir". Bollywood Hungama. Archived from the original on 13 August 2016. Retrieved 9 July 2016. ^ "Review: Wazir's music is haunting". Rediff. 3 January 2016. Archived from the original on 5 August 2017. Retrieved 9 July 2016. ^ a b c Aelina Kapoor (16 January 2016). "Review: Sanam Re's music is impressive". Rediff. Archived from the original on 10 September 2016. Retrieved 9 July 2016. ^ Kasmin Fernandes (15 January 2016). "Music Review: Sanam Re". The Times of India. Retrieved 9 July 2016. ^ Surabhi Redkar (4 February 2016). "Sanam Re Music Review". Koimoi. Archived from the original on 25 July 2016. Retrieved 9 July 2016. ^ a b "Music Review: Ishq Forever". The Times of India. Archived from the original on 12 August 2017. Retrieved 13 July 2017. ^ a b "Music Review: Ishq Forever". Rediff.com. Archived from the original on 5 August 2017. Retrieved 13 July 2017. ^ a b "Music Review: Ishq Forever". BollywoodHungama.com. Archived from the original on 5 August 2017. Retrieved 13 July 2017. ^ Mihir Bhanage (29 April 2016). "Music review of Sairat". The Times of India. Archived from the original on 10 August 2016. Retrieved 23 August 2016. ^ Sankhayan Ghosh (24 April 2016). "Music beyond words". The Hindu. Archived from the original on 29 April 2016. Retrieved 23 August 2016. ^ Mohar Basu (29 July 2016). "Music review: 'Rustom'". The Times of India. Retrieved 18 August 2016. ^ a b Devesh Sharma (16 July 2016). "Music Review: Rustom". Filmfare. Archived from the original on 20 August 2016. Retrieved 18 August 2016. ^ a b "Devi Songs Review". Behindwoods. Archived from the original on 13 October 2016. Retrieved 17 October 2016. ^ a b R.M. Vijayakar (8 October 2016). "Music review: Tutak Tutak Tutiya (Hindi version)". India-West. Archived from the original on 8 October 2016. Retrieved 8 October 2016. ^ "63rd Filmfare Awards 2018: Nominations list". The Times of India. Archived from the original on 25 February 2018. Retrieved 25 February 2018. ^ a b Rafat (5 March 2017). "Music Review: Half Girlfriend by Glamsham". Archived from the original on 6 June 2017. Retrieved 22 June 2017. ^ a b Ahana Bhattacharya (9 May 2017). "Music Review: Half Girlfriend by Komoi". Archived from the original on 25 June 2017. Retrieved 22 June 2017. ^ "Shreya Ghoshal Mixtape out, Twitterati is all praise for the melody queen". 29 June 2017. Archived from the original on 1 July 2017. Retrieved 1 July 2017. ^ "Kannada romantic songs that ruled 2017". The Times of India. 21 March 2018. Archived from the original on 23 March 2018. Retrieved 22 March 2018. ^ "The party numbers that rocked 2017". The Times of India. ^ Ramadugu, Mridula (11 February 2018). "Tholi Prema music review: Thaman S, Armaan Malik, Shreya Ghosal's creation will leave you with mixed feelings". Firstpost. ^ Tuteja, Joginder (29 January 2018). "Music Review: Phir Se…". Bollywood Hungama. ^ "Padmavati song Ghoomar: Deepika Padukone is every bit the queen and Shahid Kapoor's smitten. Watch video". Hindustan Times. 25 October 2017. Retrieved 2 April 2018. ^ Suanshu Khurana (26 January 2018). "Music review of Padmaavat: Sounds of War". The Indian Express. Retrieved 11 April 2018. ^ Vipin Nair (22 January 2018). "'Padmaavat' album review: Music fit for a queen". The Hindu. Retrieved 11 April 2018. ^ Suparno Sarkadate=21 January 2018. "Padmaavat full music album review: From Ghoomar to Ek Dil Ek Jaan, variety in the songs makes it special". International Business Times. Retrieved 11 April 2018. ^ a b Gaurang Chauhan (27 January 2018). "Padmaavat music review: One of the best music albums in recent times". Times Now. Retrieved 11 April 2018. ^ "Deepika Padukone's 'Padmavati' song 'Ghoomar' viewed 10 million times in a single day!". The Times of India. 27 October 2017. Retrieved 2 April 2018. ^ Kameshwari, A. (20 March 2018). "Baaghi 2 song Ek Do Teen: Jacqueline steps into Madhuri's shoes with her sensuous moves". The Indian Express. Retrieved 6 April 2018. ^ "Janhvi Kapoor-Ishaan Khatter's Dhadak Title Track: Shreya Ghoshal fans have fallen in love with her voice all over again". Daily News and Analysis. 20 June 2018. Retrieved 22 July 2018. ^ "Shreya Ghoshal Biography on Saavn". Archived from the original on 3 March 2017. Retrieved 3 March 2017. ^ "Shreya Ghoshal performs in Sharjah". Gulf News. 13 May 2013. Archived from the original on 28 January 2017. Retrieved 12 June 2013. ^ "Shreya Ghoshal dedicates concert to flood victims". The Times of India. Archived from the original on 30 October 2017. Retrieved 11 June 2013. ^ "Annual day celebration of Airports Authority of India". The Times of India. 5 April 2013. Archived from the original on 27 March 2015. Retrieved 11 June 2013. ^ "Shreya Ghoshal performs at London's Royal Albert Hall". NDTV.com. 7 May 2013. Archived from the original on 13 February 2017. Retrieved 13 February 2017. ^ "Shreya Ghoshal makes her Royal Albert Hall debut on 6 May 2013". Royal Albert Hall Official Website. 16 May 2013. Archived from the original on 13 February 2017. Retrieved 13 February 2017. ^ "Shreya Ghoshal Twitter Status". 25 May 2014. Archived from the original on 25 February 2017. Retrieved 25 February 2017. ^ Sadarangani, Anil (13 March 2006). "They're all game!". The Times of India. Archived from the original on 26 December 2016. Retrieved 28 December 2015. ^ "Straight Answers". The Times of India. 22 March 2006. Archived from the original on 26 December 2016. Retrieved 28 December 2015. ^ Jain, Princy (25 March 2006). "Bollywood masala at Melbourne". Hindustan Times. Archived from the original on 6 May 2006. Retrieved 28 December 2015. ^ Ruhani, Faheem (9 January 2006). "Stars come to the AID(S)". Daily News and Analysis. Archived from the original on 3 February 2018. Retrieved 22 December 2015. ^ Ranjit, Sahaya (26 June 2006). "Just cause". India Today. Archived from the original on 2 June 2016. Retrieved 22 December 2015. ^ Sundaresan, Satish (18 October 2011). "Shreya Ghoshal to be the brand ambassador for Joy Alukkas?". Bollywood Hungama. Archived from the original on 25 September 2015. Retrieved 24 September 2015. ^ "Shreya Ghoshal to treat Vizag audience, for a cause". The Hindu. 19 April 2016. Retrieved 13 July 2016. ^ "Shreya Ghoshal Twitter Status". 22 August 2016. Archived from the original on 3 March 2017. Retrieved 3 March 2017. ^ "Shreya Ghoshal Two decades after Lata Mangeshkar, Shreya Ghoshal performs at Fox Theatre". Daily News and Analysis. 7 September 2017. Archived from the original on 12 September 2017. Retrieved 12 September 2017. ^ "Shreya Ghoshal top 10 songs". India TV. 12 March 2015. Archived from the original on 5 February 2016. Retrieved 27 December 2015. ^ Arasi, Aadal (20 December 2009). "It's Jaadoo, It's Nasha". The Times of India. Archived from the original on 27 December 2015. Retrieved 27 December 2015. ^ "Shreya Ghoshal treats fans to hits at Dubai concert". Yahoo News. 1 December 2014. Archived from the original on 10 May 2017. Retrieved 8 September 2016. ^ Singh, Veenu (24 August 2013). "Personal Agenda: Shreya Ghoshal, Singer". Hindustan Times. Archived from the original on 30 September 2015. Retrieved 28 August 2013. ^ Kumar, S. Shiva (14 August 2009). "Melody meaning". The Hindu. Retrieved 1 May 2014. ^ "Bollywood wishes Lata Mangeshkar on her 85th birthday". Daily News and Analysis. 28 September 2014. Archived from the original on 31 October 2015. Retrieved 27 December 2015. ^ Dasgupta, Piali (30 January 2010). "It's a pat on the back: Shreya". The Times of India. Retrieved 26 December 2015. ^ Jasraj, Pandit (11 October 2011). "'Kahaan tum chale gaye'". Afternoon. Archived from the original on 5 March 2016. Retrieved 27 December 2015. ^ a b "Shreya Ghoshal on Top-Of-the-Charts". Bollywood Hungama. 24 December 2009. Archived from the original on 26 December 2015. Retrieved 26 December 2015. ^ Sarkar, Sonia (22 February 2015). "Voices they are a-changin'". The Telegraph. Archived from the original on 23 February 2016. Retrieved 26 December 2015. ^ "Chords & Notes: Jism... M.M. Kreem... Saregama". The Hindu. 20 January 2003. Archived from the original on 8 July 2004. Retrieved 26 December 2015. ^ Srinivas, Saraswathy (25 April 2007). "Ilayaraja creates history". Rediff.com. Archived from the original on 4 March 2016. Retrieved 26 December 2015. ^ a b c Khurana, Suanshu (4 April 2014). "India's idol: Shreya Ghoshal". The Indian Express. Archived from the original on 5 March 2016. Retrieved 26 December 2015. ^ Fernandes, Kasmin (11 December 2015). "Shreya Ghoshal: I just follow what my body and vocal chords say". The Times of India. Archived from the original on 15 December 2015. Retrieved 26 December 2015. ^ "Queen of the charts". The Hindu. Archived from the original on 30 October 2013. Retrieved 30 June 2013. ^ Thombare, Suparna (17 November 2015). "From 'Devdas' to 'Bajirao Mastani': When Shreya Ghoshal, Sanjay Leela Bhansali Created Magic Together". India West. Archived from the original on 25 December 2015. Retrieved 26 December 2015. ^ a b Tyagi, Shivli (23 December 2003). "Enter Bollywood's young nightingale". The Times of India. Archived from the original on 10 September 2016. Retrieved 22 December 2015. ^ a b "Sonu Nigam, Shreya Ghoshal best singers: Vidhu Vinod Chopra". The Times of India. 5 December 2015. Archived from the original on 10 August 2017. Retrieved 31 December 2014. ^ a b "Sonu Nigam, Shreya Ghoshal best singers: Vidhu Vinod Chopra". The India Express. 5 December 2015. Archived from the original on 8 October 2017. Retrieved 31 December 2014. ^ "M. Jayachandran feels honoured to work with Shreya Ghoshal". The Times of India. 16 January 2017. Archived from the original on 5 March 2017. Retrieved 6 March 2017. ^ Veenu Singh (24 August 2013). "Personal Agenda with Shreya Ghoshal". Hindustan Times. Archived from the original on 16 September 2016. Retrieved 1 September 2016. ^ "Shreya Ghoshal And Many More Are Ankit Tiwari's Favorite Singers". BollywoodHungama.com. 25 October 2016. Archived from the original on 12 March 2017. Retrieved 12 March 2017. ^ "Sonu Nigam and Jeet Gannguli Interview and Rapid Fire". YouTube. 21 May 2016. Retrieved 3 June 2016. ^ Sutapa Singha (3 October 2013). "Interview with Papon". The Times of India. Archived from the original on 18 April 2017. Retrieved 3 September 2016. ^ "Salman sir tells me who not to work with, says singer Palak Muchhal". Mid Day. Archived from the original on 22 December 2017. ^ "My singing style is based on what the youth likes: Sukhwinder Singh". DNA India. Archived from the original on 27 February 2018. ^ "Interview With Bombay Jayashri". Daily News and Analysis. 19 March 2017. Archived from the original on 31 July 2017. Retrieved 7 July 2017. ^ "A soulful journey". The Hindu. 11 June 2013. Archived from the original on 15 June 2013. Retrieved 12 June 2013. ^ "Interview With Neha Kakkar". The Hindu. 29 December 2016. Archived from the original on 3 July 2017. Retrieved 7 July 2017. ^ Ritika Handoo (16 January 2015). "Interview with Richa Sharma". Zee News. Archived from the original on 30 January 2017. Retrieved 30 January 2017. ^ "Ghulam Ali believes rap culture is spoiling real culture of music". Hindustan Times. 8 April 2016. Archived from the original on 6 March 2017. Retrieved 6 March 2017. ^ "I still cry remembering Nusrat Fateh Ali Khan sahab: Rahat". The Times of India. 24 January 2015. Retrieved 18 July 2016. ^ "Pakistani singer Syed Asrar Shah: I want to touch Lataji's feet". The Times of India. 21 August 2015. Retrieved 18 July 2016. ^ "Acapella band Penn Masala's final India gig in Delhi". Business Standard. 27 May 2016. Archived from the original on 6 June 2016. Retrieved 3 June 2016. ^ "Diya Mirza is a fan of Shreya Ghoshal". Zoom TV's Verified YouTube channel. 2 March 2016. Retrieved 13 June 2016. ^ "M. S. Dhoni at Audio Release Of 'Kya Yahi Sach Hai'". Bollywood Hungama's Verified YouTube Channel. Retrieved 22 September 2017. ^ "A. R. Rahman has changed Indian music scenario: Vishal Bharadwaj". India.com. 16 December 2015. Archived from the original on 11 October 2016. Retrieved 1 September 2016. ^ "X Factor India - Karan Johar's surprise announcement- X Factor india - Episode 8 - 10th June 2011". YouTube. 29 June 2011. Retrieved 23 September 2017. ^ Vinayak Chakravorty (19 August 2016). "Interview with Kanika Kapoor". Dailymail.co.uk. Archived from the original on 30 January 2017. Retrieved 30 January 2017. ^ Priya Adivarekar (16 April 2014). "The musical prima donna". Indian Express. Archived from the original on 20 September 2016. Retrieved 8 September 2016. ^ "My Top Ten (Roma Sagar)". Eastern Eye. 5 October 2017. Archived from the original on 17 October 2017. Retrieved 8 October 2017. ^ "Roma Sagar talks about Music and Collaboration". DesiBlitz.com. 16 March 2017. Archived from the original on 8 October 2017. Retrieved 8 October 2017. ^ "I want to use my English twang to carve a niche in Bollywood: Tripet Garielle". The Times of India. 29 July 2017. Archived from the original on 17 November 2017. Retrieved 22 September 2017. ^ "Shreya Ghoshal is my Idol, Ananya Nanda". Mid Day. 8 September 2015. Archived from the original on 19 September 2016. Retrieved 19 September 2016. ^ "Usha Uthup: 42 forever and ever!". Daily News and Analysis. 6 July 2007. Archived from the original on 2 December 2017. Retrieved 5 May 2016. ^ "I never considered myself a singer: Manna Dey". Hindustan Times. Archived from the original on 18 May 2017. Retrieved 7 July 2017. ^ Sangeetha, P (29 May 2015). "I do not abuse my voice: Vani Jairam". The Times of India. Archived from the original on 21 June 2015. Retrieved 31 October 2015. ^ "Dada Sahab Phalke award is God's gift: Manna Dey". India Today. 19 October 2009. Archived from the original on 9 June 2013. Retrieved 12 June 2013. ^ Pawa, Yogesh (17 August 2014). "Musical notes with Alka Yagnik". Daily News and Analysis. Archived from the original on 22 January 2017. Retrieved 1 September 2016. ^ Olivera, Roshni (8 September 2012). "Asha Bhosle is against the word Halkat Jawani". The Times of India. Archived from the original on 21 December 2016. Retrieved 1 September 2016. ^ "Interviwe With Lata Mangeshkar". The Times of India. 25 April 2017. Retrieved 7 July 2017. ^ "Ankhiyon Ke Jharokhon Se singer returns to playback after two decades". Mid Day. ^ "Kavita Krishnamurthy: I have done enough in the industry". The Times of India. 17 January 2017. Archived from the original on 6 March 2017. Retrieved 6 March 2017. ^ "How Kumar Sanu stole many hearts". telanganatoday.com. ^ "The Historic A-Z Of Bollywood Music". Eastern Eye. 25 October 2017. Archived from the original on 27 October 2017. ^ AR, Reshmi (26 June 2012). "June 26 is Shreya Ghoshal Day". The Times of India. Archived from the original on 2 April 2015. Retrieved 8 July 2012. ^ "Fans celebrate Shreya Ghoshal Day on micro-blogging sites". The Times of India. 26 June 2013. Archived from the original on 2 April 2015. Retrieved 30 June 2013. ^ "2012 Celebrity 100 List — Forbes India". Forbes India. Archived from the original on 11 July 2015. Retrieved 3 August 2013. ^ "2013 Celebrity 100 List — Forbes India". Forbes India. Archived from the original on 19 February 2014. Retrieved 8 February 2014. ^ "2014 Celebrity 100 List -Forbes India". Forbes India. Archived from the original on 11 July 2015. Retrieved 24 June 2015. ^ "2015 Celebrity 100 List - Forbes India". Forbes India. Archived from the original on 14 March 2016. Retrieved 4 April 2015. ^ "2016 Celebrity 100 List - Forbes India". Forbes India. Archived from the original on 15 January 2017. Retrieved 15 January 2017. ^ "Top 5 Celeb100 Singers and Musicians". Forbes India. 31 January 2013. Archived from the original on 22 December 2015. Retrieved 31 August 2016. ^ "VERVE'S 50 POWER WOMEN OF 2016 (List)". Vervemagazine.in. 7 July 2016. Archived from the original on 30 September 2017. Retrieved 30 September 2017. ^ Sarah Salvadore (10 September 2009). "I'll work even harder: Shreya". The Times of India. Archived from the original on 12 September 2016. Retrieved 13 September 2016. ^ Sarah Salvadore (27 January 2010). "National Award made me conscious: Shreya". The Times of India. Archived from the original on 12 September 2016. Retrieved 13 September 2016. ^ "There is lack of sincerity in music today: Shreya Ghoshal". Hindustan Times. 27 November 2015. Archived from the original on 5 October 2016. Retrieved 5 October 2016. ^ "Shreya Ghoshal in Eastern Eye". India Today. 5 December 2013. Archived from the original on 17 September 2016. Retrieved 10 May 2015. ^ "List of the greatest 20 Bollywood playback singers published in Eastern Eye newspaper". India Times. 25 June 2015. Archived from the original on 11 October 2016. Retrieved 21 July 2016. ^ "Top 10 Hottest Female Bollywood Lead Singers". MensXP.com. Archived from the original on 13 January 2016. Retrieved 31 August 2016. ^ Prasher, Shantanu. "50 Most Influential Indians On Social Media". MensXP.com. Archived from the original on 25 September 2015. Retrieved 24 September 2015. ^ "India Facebook page statistics". Socialbakers. 5 December 2013. Archived from the original on 8 May 2016. Retrieved 10 May 2016. ^ "Twitter statistics for India". Socialbakers. 5 December 2013. Archived from the original on 5 May 2016. Retrieved 10 May 2016. ^ "Ghoshal, the most searched celebrity on Google". India Today. 15 July 2016. Archived from the original on 16 August 2016. Retrieved 17 July 2016. ^ "Shreya Ghoshal to have her wax statue at Madame Tussauds". Bollywood Hungama. 15 March 2017. Archived from the original on 16 March 2017. Retrieved 16 March 2017. ^ "Shreya Ghoshal first Indian singer to be immortalised in wax at Madame Tussauds". News Nation. 15 March 2017. Archived from the original on 16 March 2017. Retrieved 16 March 2017. ^ Dubey, Rachana (26 June 2010). "Sonu, Raahat replace judges on Chhote Ustaad 2". Hindustan Times. Archived from the original on 25 September 2015. Retrieved 24 September 2015. ^ "Get ready for 'Music Ka Maha Muqqabla'". The Times of India. 15 December 2009. Retrieved 22 December 2009. ^ "Sanjay-Sonu's conflict over eviction!". The Times of India. 13 July 2011. Archived from the original on 28 February 2015. Retrieved 9 October 2011. ^ "A.R. Rahman & Kapil Sibal - Kismat Se Full Video feat. Shreya Ghoshal Album Raunaq". Sony Music India. Archived from the original on 17 July 2017. Retrieved 10 August 2017. ^ "Dhadkane Azad Hain - Official Video - Shreya Ghoshal - Deepak Pandit - Manoj Muntashir". Retrieved 16 August 2017. ^ "Birthday special: Lesser known facts about the beautiful singer Shreya Ghoshal". BollywoodLife.com. Archived from the original on 9 September 2017. Retrieved 9 September 2017. ^ a b "48th Filmfare Awards". Rediff. 22 February 2003. Archived from the original on 15 September 2016. Retrieved 15 September 2016. ^ "49th Filmfare Awards". The Times of India. 21 February 2014. Archived from the original on 15 September 2016. Retrieved 15 September 2016. ^ "53rd Filmfare Awards". Glamsham. 25 February 2008. Archived from the original on 15 September 2016. Retrieved 15 September 2016. ^ "54th Filmfare Awards". Glamsham. 3 March 2009. Archived from the original on 15 September 2016. Retrieved 15 September 2016. ^ "Utmost pleasure' singing for cinema of South India: Shreya Ghoshal". Hindustan Times. 10 November 2016. Archived from the original on 22 March 2017. Retrieved 23 March 2017. Wikimedia Commons has media related to Shreya Ghoshal.